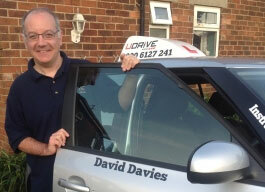 Hi, I’m David, I have just qualified as a driving instructor after 17 years of office based jobs. I decided I needed a new challenge and change of career so decided to do something that I love doing and that is driving, so what better way than to teach people new skills and develop their knowledge of the road. I am enthusiastic and passionate about driving and think driving should be enjoyable and fun, but also safe. I think it is important to encourage and provide confidence to anyone that is learning to drive. I drive a Skoda Fabia, which is a great safe car to learn to drive in. I am married with 2 wondewrful children and have lived in the Lincoln area since 2005. When I am not driving, in my spare time I enjoy spending time with the family and the dog! I don’t play much sport but love watching many different sports, especially Lincoln City and being from Wales I enjoy the rugby. I am approachable and easy to get on with. I am not a person who would shout at someone, that does not help any situation. I approach everything I do with a professional and fair attitude.